A Shrine filled with a lot of cute rabbits as its guardian deity, is a place to pray for safe births of children. Okazaki Shrine 「岡崎神社」, located near Heian-Jingu Shrine, is a Shinto shrine with a long history. The shrine dates back to the Heian Period. It was built in 794 as one of the four shrines at the compass points of the new capital, when the capital was moved from Nagaoka by the Emperor Kanmu. Originally Okazaki Shrine was built to protect the east side of the Emperor and citizens from evil. After, the successful birth of an empress in 1178, the shrine became popular for locals to pray for fertility and safe births of children as well as its original purpose. Okazaki Shrine is dedicated to Susano-no-mikoto and Kushinadahime-no-mikoto. The shrine is also dedicated to rabbits. ● The main hall with rabbit guardians. ● Rabbit Amulets, a good-luck charm. Rabbits are known for their productivity in producing offspring. A bunch of rabbits lived in the mountain behind the shrine, are believed as a helper animal of the enshrined Kami, Susano-no-mikoto and Kushinadahime-no-mikoto. Visitors can see all kind of rabbit tributes throughout the ground from statues, lanterns to ema, the wooden plaques that you write your wishes on. The black rabbit statue stands at the chozuya, water purification to the right front of the main hall is particularly popular. ● The black rabbit statue . Nowadays, Okazaki Shrine is a popular place to have a traditional Japanese Shinto wedding ceremony. There must be an opputunity to see a Japanese wedding on weekends. 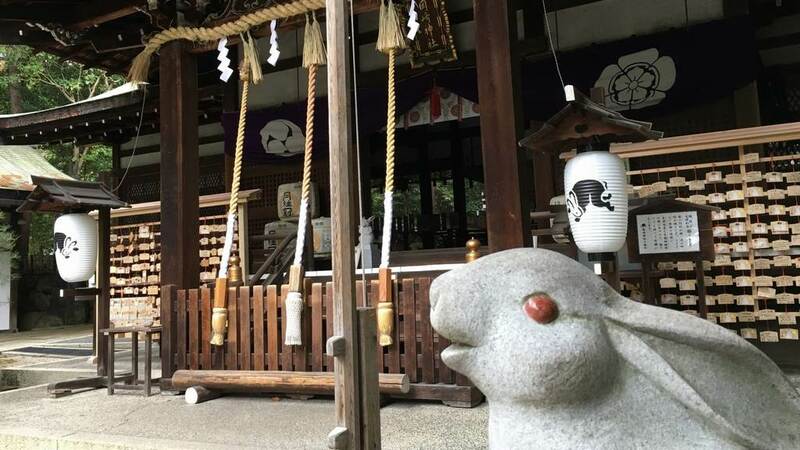 If you’re in Japan for a honeymoon, and planning to start a family soon, or just a rabbit lover, Okazaki Shrine is the place to visit. Access : 20-minute walk from Jingu-Marutamachi station on the Keihan line, or Higashiyama or Keage stations on the subway Tozai line. Bus : Kyoto city bus #32, #93, #100, #203 or #204 to the Okazakijinja-mae stop.